The last mini swap quilt for the year is finished. Some people think I will not have the power to resist signing up for more swaps but they are wrong. There are holiday gifts to be made! Must. not. join. any. more. swaps. this. year. The recipient of this quilt did not specify any favorite colors or any preferred patterns or fabrics. Hmmmm what to do? Well, she lives in Norway so I made her a scrappy Norwegian flag. This one came together pretty well except for the binding. I had to rip and reapply one binding piece three times before it was right! In October I will be taking a free motion quilting class! I have tried it on my own with heinous results. But I really really need to master this technique – or at least get decent at it. Hopefully, looking forward to this class will help me forget the undercurrent of panic caused by McCain’s choice of Vice-Presidential candidate. If he wins and he dies – aaauuugggggghhh just thinking about it makes my head explode. This entry was posted on September 2, 2008 at 8:56 am and is filed under Uncategorized. You can follow any responses to this entry through the RSS 2.0 feed. You can leave a response, or trackback from your own site. 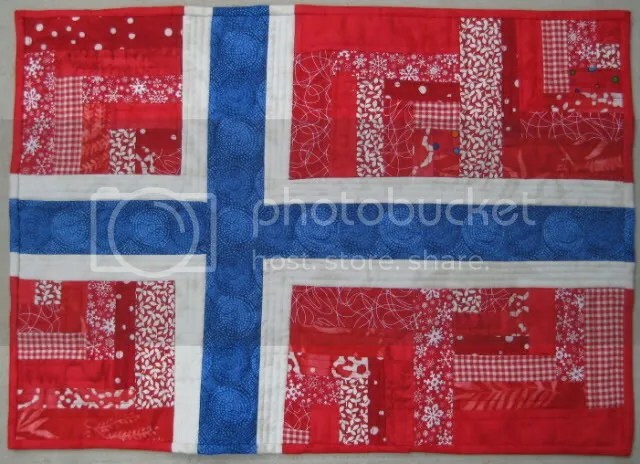 Do you have any more Norwegian flag quilts (same colors as your picture) and if so, how much are they and could it be mailed to Houston, Tx before Christmas? Sorry to be so long replying. I don’t use this blog any more and check in rarely. I made this one for a swap and don’t have any more. I am sorry to say that I am swamped with sewing all the way through Christmas. This quilt was a mini quilt, not full sized. If you want to talk about one for next year, e-mail me at getstitchy AT yahoo.com. Thanks!